A customer of mine is upgrading their SharePoint 2010 farm to SharePoint 2013. As part of the upgrade process they also wish to convert their existing Host Header Web Application to Host-Named Site Collection. The client has 2 to 3 content databases per Web Application in their SharePoint 2010 environment. It is imperative that the URLs used to access the content do not change. 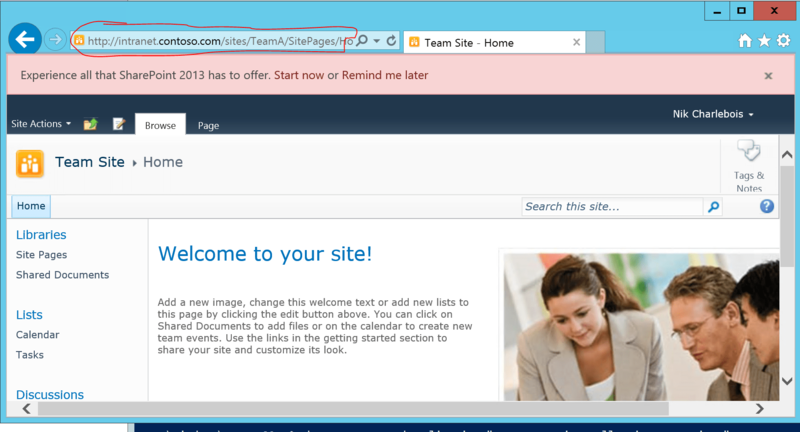 The client also wants to keep the SharePoint 2010 look for the migrated sites, at least for a month after migration. Therefore the Host Header Web Appplication to Host Name Site Collection move is simply for administrative purposes. Also, the client is not using the current root of their Host Header Web Application. So for example, there is no content if users were to browse to http://intranet.contoso.com. Content only exists in site collections under managed paths such as http://intranet.contoso.com/sites/TeamA. The present article covers the process you are required to follow if you wish to accomplish this migration. In summary, the Host Header Web Application is located at “http://intranet.contoso.com”. This Web Application is servered by two content databases: Intranet-Content-1 which contains two site collections and Intranet-Content-2 which only contains 1 site collection. ***This article assumed you have a plain vanilla SharePoint 2013 server setup and ready to receive the 2010 content. In order to bring our SharePoint 2010 Web Applications over SharePoint 2013 and convert them to Host-Named Site Collections, we first need to create a new Web Application without a Host Header that will act as a container for these Host Name Site Collections. This web application will not be serving any web request properly speaking, meaning that it’s root will never be accessed by our clients via the browser. We will also be creating a root site collection in this Web Application. This root site collection will never be used by users, it is simply there to ensure the requests to the server are properly processed. This “no host header” web application is also required for you to be able to properly run SharePoint add-ins (another topic for another day).. The new Web application we will be creating will be running on port 80 and won’t be configured using a Host Header. Even if you have another Web Application running on port 80 in your SharePoint 2013 environment, that root Web Application has to be created without a host header and on port 80. I will be giving our new Web Application the name “Host Name Site Collections Container”. ***Notice that our Web Application is created using Classic Authentication mode which is deprecated in SharePoint 2013. Do not worry, as part of our complete upgrade process, once all the Host Name Site Collections have been properly created, we will convert our Web Application to Claims Based Authentication. The convertion process will be covered in an upcoming blog post. 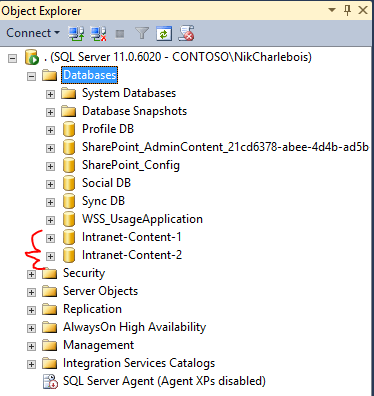 The nextstep is to bring the SharePoint 2010 Content Databases over to your SharePoint 2013 server. In order to do this, we will be copying both the .MDF and .LDF files of our two content databases (Intranet-Content-1 and Intranet-Content-2) over the 2013 server. You can choose to copy a backup of the files, but in my case, I want to ensure no one can access the content from the SharePoint 2010 server while I’m in the process of doing the migration, so I will simply be dataching the databases from the SharePoint 2010 SQL server and closing all existing connections to it. 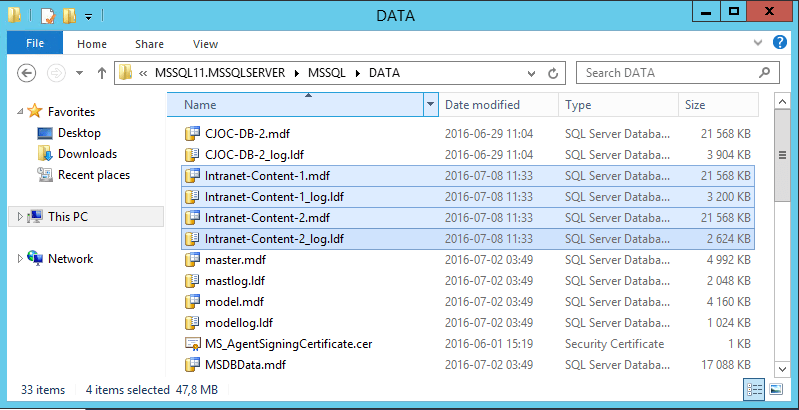 Open SQL Server Management Studio and navigate to your Content Databases. 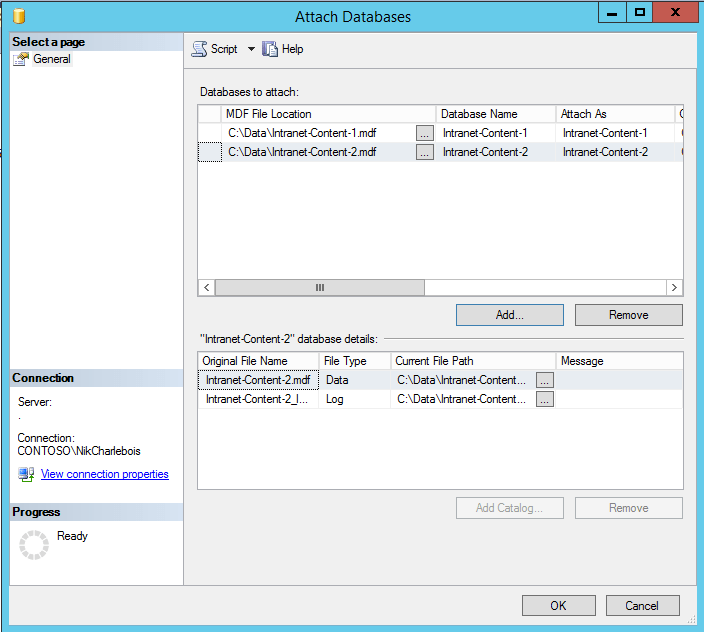 Right click on the Intranet-Content-1 database and select Tasks > Detach. When the dialog box appears, make sure you check the Drop Connections box, then click OK.
Repeat the process for all other content databases, in my case for Intranet-Content-2. Now that our databases have been detached from our live SQL Server, we can move their associated files over to the SharePoint 2013 server. Find the path to your files, in my case they were located under “C:\Program Files\Microsoft SQL Server\MSSQL11.MSSQLSERVER\MSSQL\DATA“. Grab both the .mdf and .ldf file for each content database. 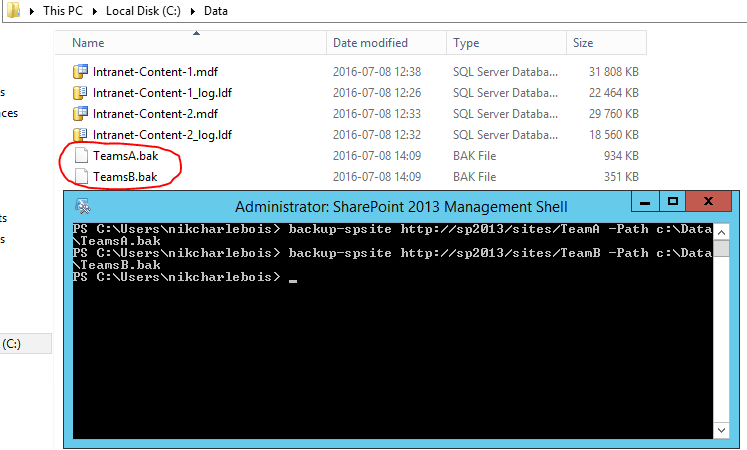 Copy the files over to the SharePoint 2013 SQL server (in my case to C:\Data). 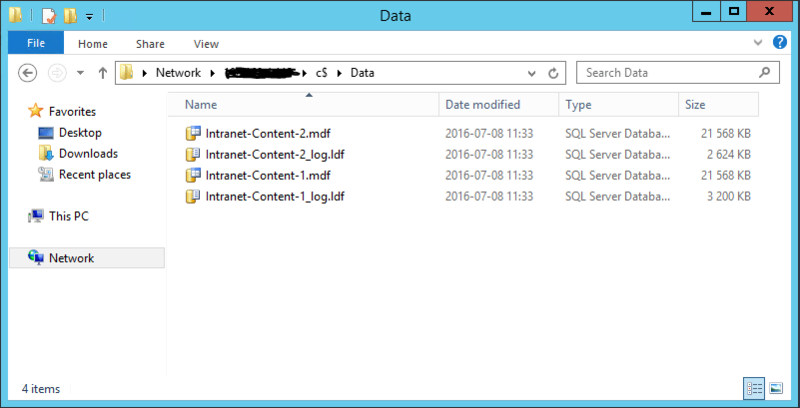 Now that the files have been moved over to the SharePoint 2013 SQL Server, we need to attach them to it. 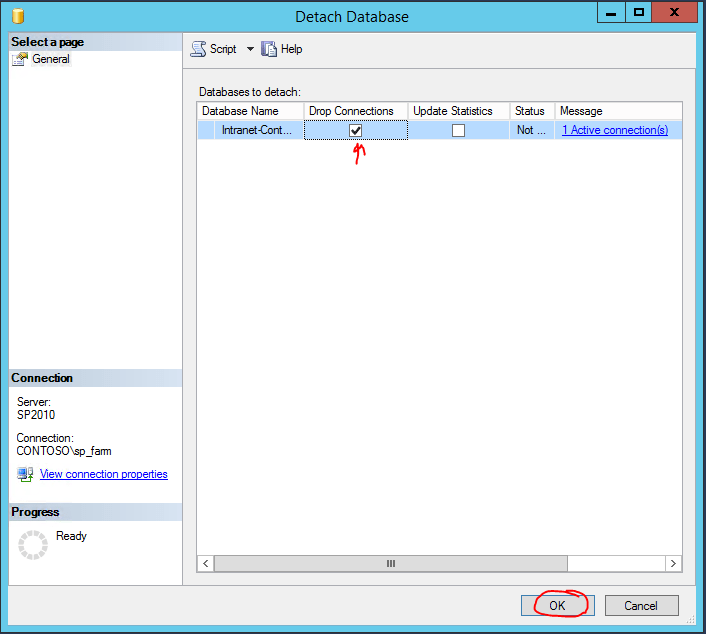 Open SQL Server Management Server on the SharePoint 2013 SQL Server. 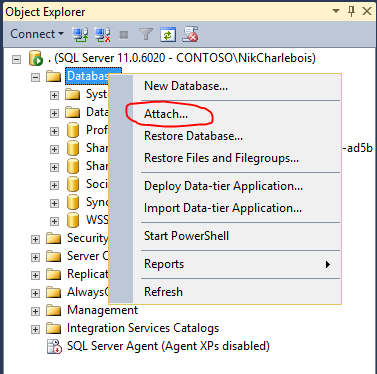 In the Object Explorer panel, right-click on the Databases folder, and select “Attach…”. In the “Attach Database” window that pops-up, click on the Add… button and browse to the Intranet-Content-1.mdf file we’ve copied over in the previous step. Select the .mdf file and click OK.
Repeat the same process for all content databases, in my case for Intranet-Content-2. Once completed, you should see the content databases listed in the “Databases to attach:” section of the “Attach Databases” window. Ensure all the proper databases are listed and click “OK”. 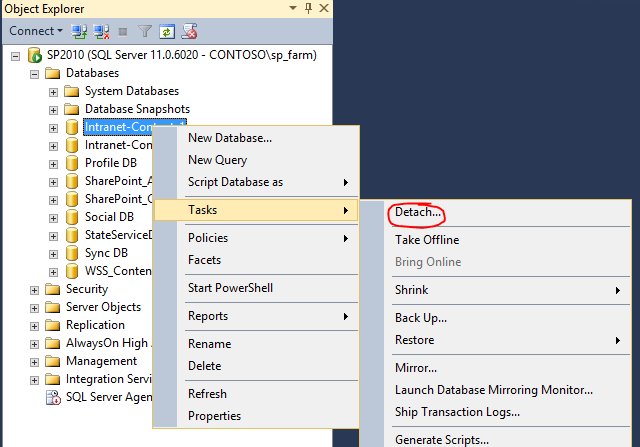 You should now see the SharePoint 2010 databases listed in the Object Explorer panel. 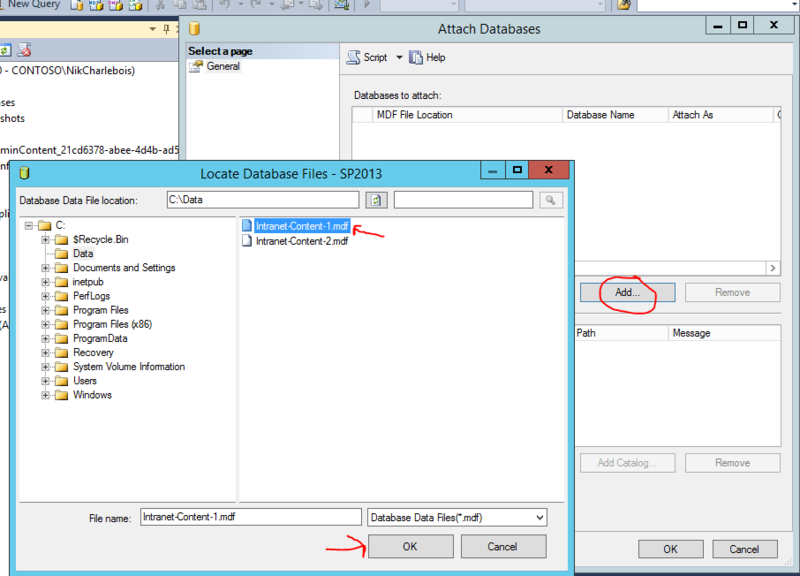 Simply attaching the content databases to SQL Server is not enough fopr SharePoint to recognize these as content databases. We need to do a mount operation on our content databases in order for SharePoint to upgrade their schema to SharePoint 2013 and associate them with our temporary Web Application created at Step 1 above. To mount a content database onto a SharePoint 2013 farm, we need to use the following line of PowerShell code. Running the command will take a few minutes to complete, and PowerShell will display the upgrade percentage as it does the upgrade of the Database schema. Mount-SPContentDatabase -Name "Intranet-Content-1" -WebApplication "Host Name Site Collections Container"
Once the mounting process has completed, you’ll need to run the above PowerShell line of code for all other Content Databases, in my case for Intranet-Content-2. 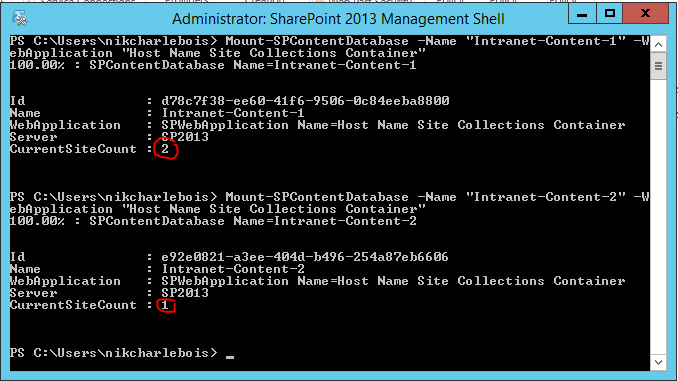 However, these are not Host Name Site Collections, and more importantly, the URL to access them is not the same as it was in SharePoint 2010 which was one of our requirement for the upgrade. $webApp = Get-SPWebApplication "Host Name Site Collections Container"
New-SPSite -Url "http://intranet.contoso.com" -HostHeaderWebApplication $webApp -OwnerAlias "contoso\sp_farm"
You may be wondering why is it you need to have a Site Collection created at the root of the http://intranet.contoso.com if I mentionned earlier that the client will never browse to this location. The reason for this empty site collection to exist is to be able to properly serve server resources to sites collections located under one of its managed path (e.g. http://intranet.contoso.com/sites/TeamsA). If this site does not exist, you will encounter an error that mentions that a site has to exist at the root when trying to create “sub-site collections” (under /sites). Back in February 2015, Microsoft released a Cummulative Update for SharePoint 2013 that modifies the behavior of the SPSite.Rename method within the object model. This method can now be used to change the URL of a site collection to a host-header one. 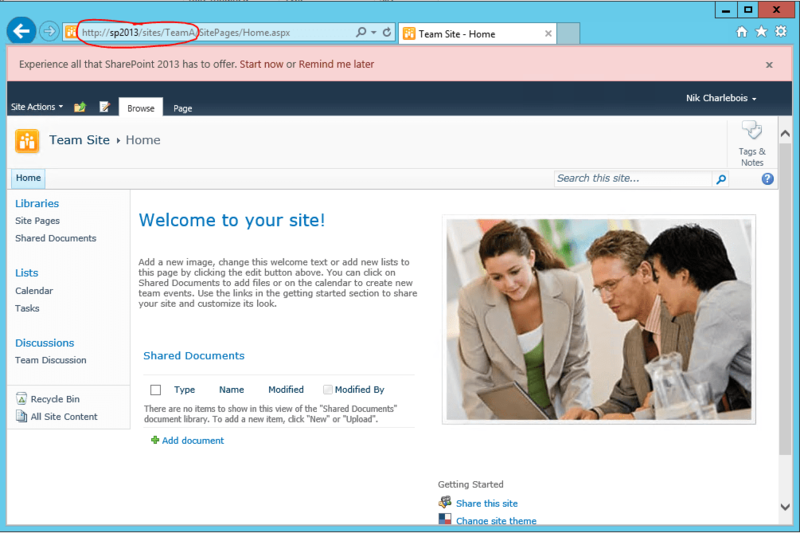 In order to be able to leverage this new change, your SharePoint 2013 requires you to be at least on build 15.0.4693.1001. For more information regarding this change, you can read the following Knowledge Base article https://support.microsoft.com/en-us/kb/2910928 (thanks to my colleague Roger Cormier for the info). *** Note that the code above will cause an outage. Ideally, if you have multiple sites to rename at once you can proceed with the renaming and then simply run IISReset once. Another, less prefered option is to convert the upgraded site collections to Host Name Site Collection by doing a backup our site, and then importing it back in as a Host-Named Site Collection. To backup the sites, I will be using the Backup-SPSite PowerShell cmdlets and will be backing up my data in the c:\Data folder of my server. You are now done. Open your browser and navigate to your new Host-Named Site Collection to ensure everything is working as expected. Nik, you are a god among men. Thanks for this. There is very little info about the SPSite.Rename() option out there so it was good to see it in action. I have a SP2010 farm with 50 webapps, 50 sitescol, 50 DB and 50 IIS pool and I can’t migrate in place. You saved me long hours in backuping / restoring sites for my upgrade to sharepoint 2013. All my sites collections where acceded by root ( / ), so I followed everything exept the New-SPSite process. When I mount a new database to my webapp, a new site were created and I only rename this site.